Budget Hotels > Travel Blog > Destinations > Rishikesh > How camping in Rishikesh is the best way to come back completely rejuvenated? Gazing at a billion stars, exchanging ghost stories around the fire, soaking up the abundant nature and generally having a blast away from the city – is that your idea of fun? Then beach camping in Rishikesh is right up your alley. Spending your days by the pristine waters of the Ganges, trekking through the picturesque Shivaliks, visiting the many ashrams and just relaxing at the river beaches…aren’t these just what the doctor ordered to refresh and rejuvenate your tired city soul? An international tourist hotspot (thanks to the Beatles who camped here in the late 60s! ), Rishikesh is filled with seekers from all over India and the world, looking for a meaningful spiritual experience, a chance to be in tune with nature and to feel rejuvenated. Ashrams of spiritual leaders and healers dot the city but that’s not all that this beautiful place is about. Nestled in the Shivalik hills in the lower Himalayas, the city that finds mention in many Hindu religious texts is also a great destination for some thrilling white-water rafting in the Ganga rapids and best of all – riverside camping in Rishikesh. Regular and luxury camps in Rishikesh both at the river beaches and deep in the verdant forests spoil you for choice; some offer authentic nature experiences, some a serene environment in the verdant hills and others offer adventure sports and hiking. 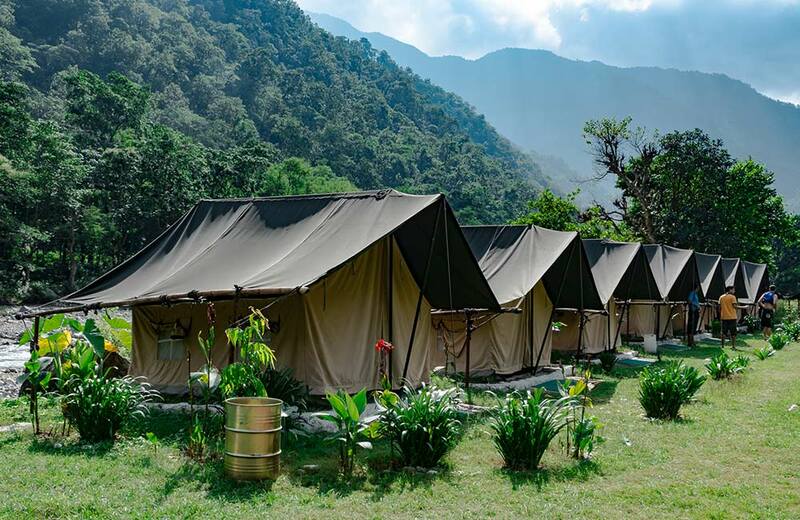 Rishikesh camping packages offer you a well-rounded experience without the trouble of having to organize things yourself and come with all the amenities you would expect in a quality hotel. So which one is the best camp in Rishikesh? Whether you want to just sit and relax at the banks of the mighty Ganges or get an adrenaline rush rafting down the rapids (with a bunch of screaming people!) or even get together with like-minded trekkers and go hiking into the hills, there is a Rishikesh camping package available for you. There are several luxury camps in Rishikesh sitting pretty right in the middle of the Rajaji National Forest that graces the region. They may be a bit of a splurge as compared to the average Rishikesh camping price list, but totally worth your money. Swiss tents and luxurious cottages allow you to get to live the true outdoorsy experience yet have all the modern comforts – think bathrooms with running water, air conditioning and queen sized beds! You can enjoy unspoiled views of the dense Rajaji National Forest while enjoying a fabulous buffet-style meal that’s available in most camps. Authentic camping experiences can also come from riverside camping in Rishikesh where most camps have no more than a dozen tents. This means you have smaller crowds, you get to know everybody and the service is better. You could also book an entire camp if you are planning to go with family or friends and make it a fun ‘home-zone’ kind of a thing. You could choose a camp that has unobstructed views of the Shivaliks, or one that is not too close to the city of Rishikesh so you can enjoy some peace and quiet too, without having to hear all the traffic noises! Camps that are not exactly at the riverfront are just as much fun as riverside camping in Rishikesh because you will need to do a bit of a bushwalk to get to the river resulting in a mini-trek every day. Quite a change from all that asphalt in the city, right? 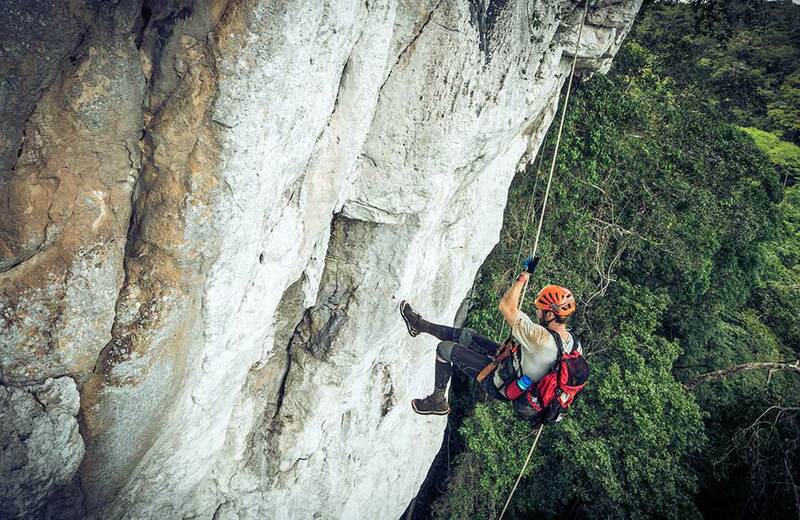 Most camps in Rishikesh have adventure teams lead by trained guides and will offer you rappelling, zip lining over the Ganges to trekking in the thick Himalayan forests, mountain bicycling and paintball. Other activities include jungle safaris and bungee jumping. We would recommend trying out all of these for an adrenaline-pumping experience. There are also other camps in Rishikesh that offer you a real scrubbed down, authentic experience at beach camping in Rishikesh. Most are unsullied by traffic noises and hordes of holidaymakers, are close to the river or one of its tributaries and are quite basic without being to the point of discomfort. So expect comfortable tents, well-organized kitchens that treat you to robust Pahari food and a wide array of activities to choose from. Camping in Rishikesh means a new experience unavailable at the beach or even a mountain resort. There is lot to do and see and most of it unusual for us city dwellers. Calm and serene or completely adventurous; you can pick what kind of a holiday you want in Rishikesh. Either way, you are sure to come back relaxed and rejuvenated and probably already planning the next trip back! 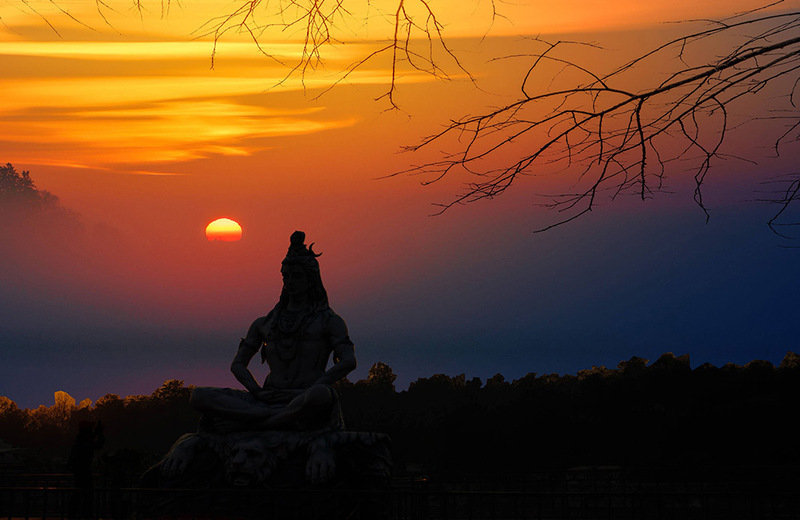 Known as the ‘Yoga Capital of the World’, ‘Gateway to the Himalayas’ and the place where the holy ‘Char dham yatra’ for Hindus usually starts, Rishikesh is a historic city in the state of Uttarakhand in northern India. A sacred pilgrimage town, it has been mentioned in many Hindu scriptures like the Skanda Purana and is regarded as one of the holiest cities in the country. Famed for its many ashrams, the iconic Laxman Jhula – one of the oldest suspension bridges in the country, white water rafting and other adventure sports, Rishikesh sees a huge number of tourists from India and around the globe every year. Take a Train or a Bus: Rishikesh is easily accessible from New Delhi and Haridwar by train and bus with several options. These two are the most cost-effective ways to travel to the city.